12 On Hillel Guest Manor provides a unique combination of luxury combined with friendly hospitality and personal service. Our central location ensures easy access to restaurants, shops and entertainment, yet provides unrivalled privacy. Situated in a prestigious suburb, the Manor is easily accessed from the major motorways while the business and shopping districts of Sandton – Fourways, Rosebank and the Johannesburg CBD, are only minutes away, as are the Melville and Greenside restaurant districts. 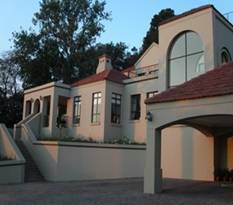 Activities in the immediate vicinity include a walk up Northcliff Hill for the more active, or a leisurely stroll in the Johannesburg Botanical Gardens, a short drive away. Perched high on the eastern slope of Northcliff Hill, “12 on Hillel” Guest Manor offers the discerning guest exceptional accommodation in a tranquil setting, with spectacular views, luxury rooms and traditional service to provide a relaxing experience to the weary traveler. The generously proportioned guest rooms all have private bathrooms, are tastefully furnished and decorated with works by South African artists, historical and contemporary. Guests have exclusive use of the swimming pool area and various patios – all with lovely views of the Johannesburg skyline. A private lounge provides an ideal setting for after dinner drinks, interacting with fellow guests, or relaxing before retiring to bed. Enjoy breakfast in the main dining room or on the patio with panoramic views of Johannesburg. We serve only the freshest and best ingredients. Our Continental Breakfast buffet includes a selection of cereal, fresh fruit and juices, freshly baked bread, an assortment of cold meats, imported cheese and a selection of home made preserves. Self contained cottage with separate kitchen (fridge, freezer, stove, and microwave oven). En-suite bathroom with shower. TV in room. Tastefully decorated in classic South African style with Oriental carpets and paintings by contemporary South African Artists.